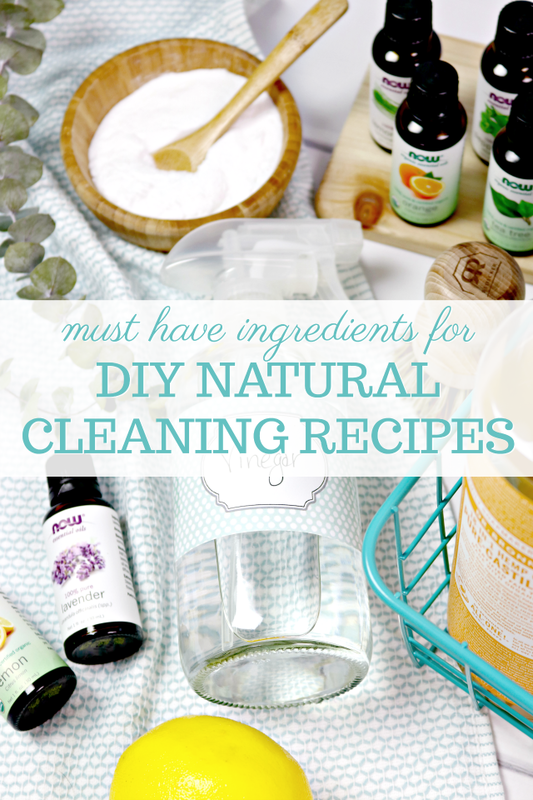 These 13 ingredients for DIY natural cleaning recipes will help you get started making your own homemade, non-toxic home cleaners and laundry products, and get you on track for cleaning your entire home naturally! 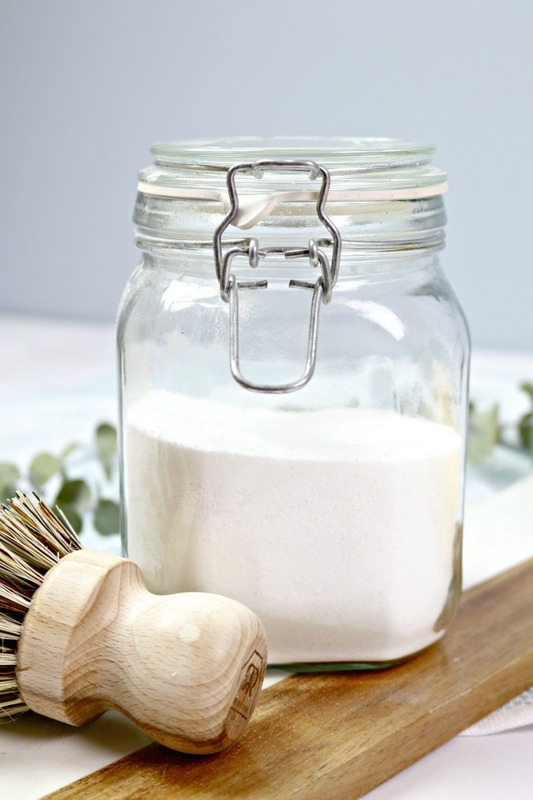 Starting the process of making your own cleaning solutions can seem daunting, but the truth is, it’s really so much easier than you think. You probably already have most of these ingredients in your pantry, and most of the others can be found at your grocery store or easily bought on Amazon. The great thing about having these items in stock at all times is that you will be able to use them for multiple recipes and they last a long time. I’m going to start by sharing the items that I have in my cleaning pantry, what they do and different cleaning recipes you can use them in. If you have any questions, you can email me directly at jessica@mom4real.com, and I’ll be happy to answer them! Now, let’s get started! Now, onto the ingredients and all of the amazing ways you can use them to clean your home! By far the most used natural cleaning ingredient that I use in our home is Distilled White Vinegar. 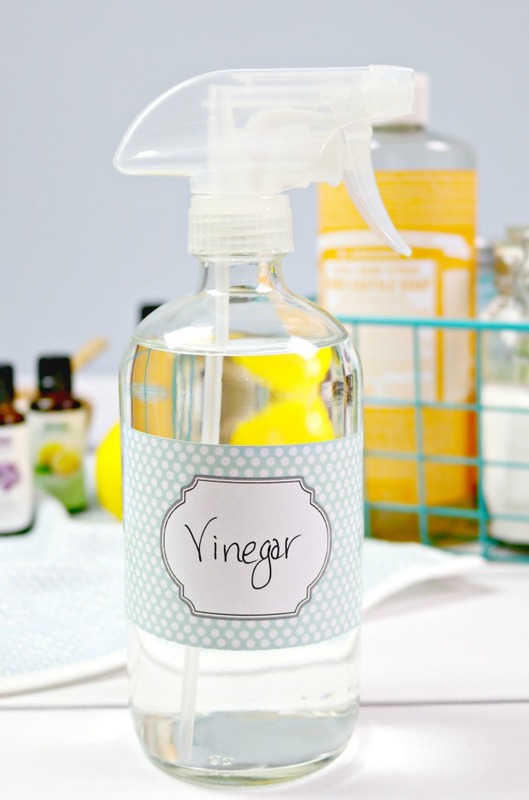 Vinegar is an amazing germ fighter, is such a great cleaner and can even be used to help unclog drains! 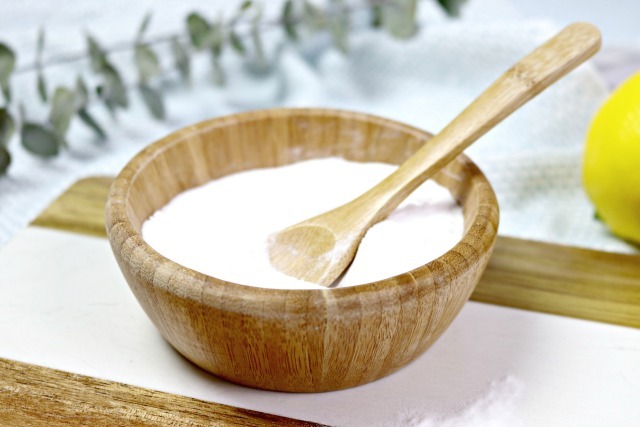 Baking soda isn’t just used for baking…it’s an awesome home cleaning agent too! It makes a great scrub, will help lift even the most burned on foods from surfaces and even helps remove melted plastic from stovetops and more! Essential oils will really take your cleaning recipes to the next level. 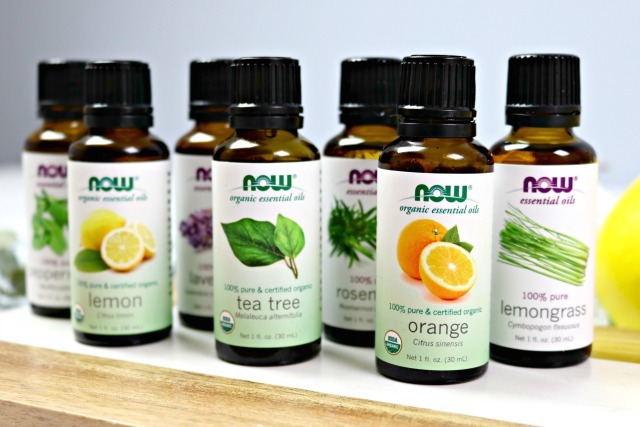 Different essential oils have different uses and properties. Some of my favorites for cleaning recipes are Lemon, Tea Tree, Orange, Rosemary, Peppermint, Lavender and Lemongrass. Orange and lemon essential oils are great grease fighters, and can remove stickers and labels with ease. Peppermint essential oil is a great disinfectant and a great natural way to deter insects from invading your home. Lavender is a great disinfectant and smells amazing. Tea Tree oil is a major germ fighter. Rosemary and lemongrass essential oils will help keep bugs away and are also great odor absorbers! Castile soap is a fabulous vegetable based soap that comes in different scents. I love them all, but their citrus scent is my absolute favorite! 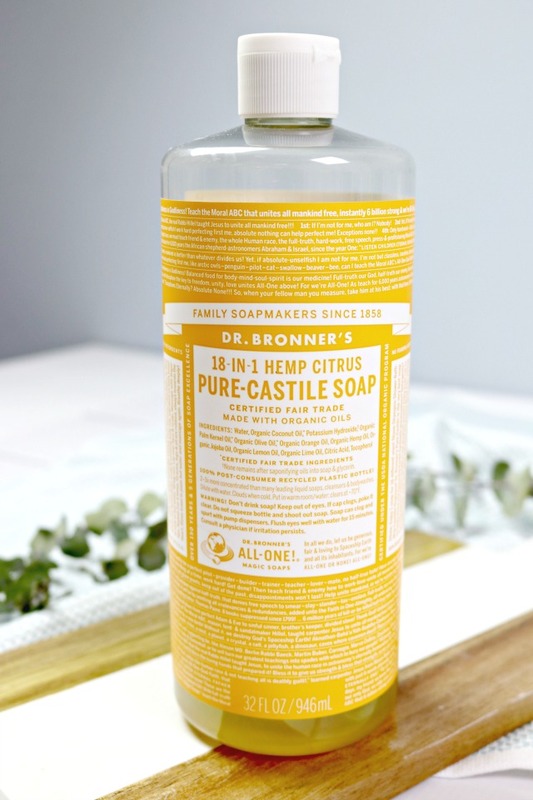 Castile soap can be used to make natural dish liquid, dish tablets, laundry soap, hand soap and sooo many more cleaning solutions without having to add a bunch of chemicals that could be toxic. A little Castile soap goes a long way and can be used for your face and body as well! Here is a recipe for Making Your Own Liquid Castile Soap if you’d like to go in that direction! 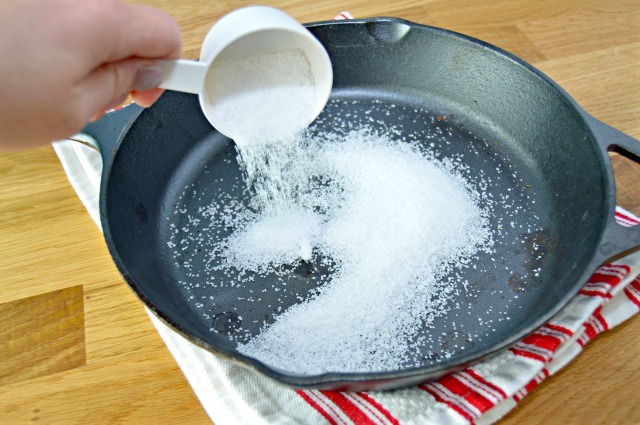 Washing soda is a great cleaning agent that you can buy in store or make yourself with only baking soda and your oven. Washing soda can be used in homemade laundry detergents and is also great for cleaning hard water stains in toilets and anywhere else. The alkaline in washing soda breaks down hard water and minerals with ease without the use of harsh chemicals. 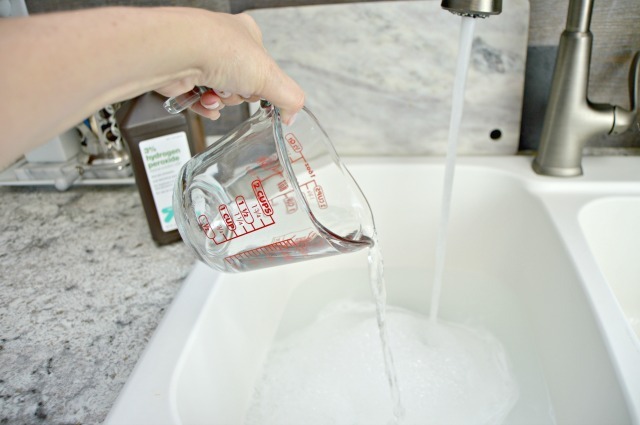 I wrote an easy post on How to Make Your Own Washing Soda HERE! 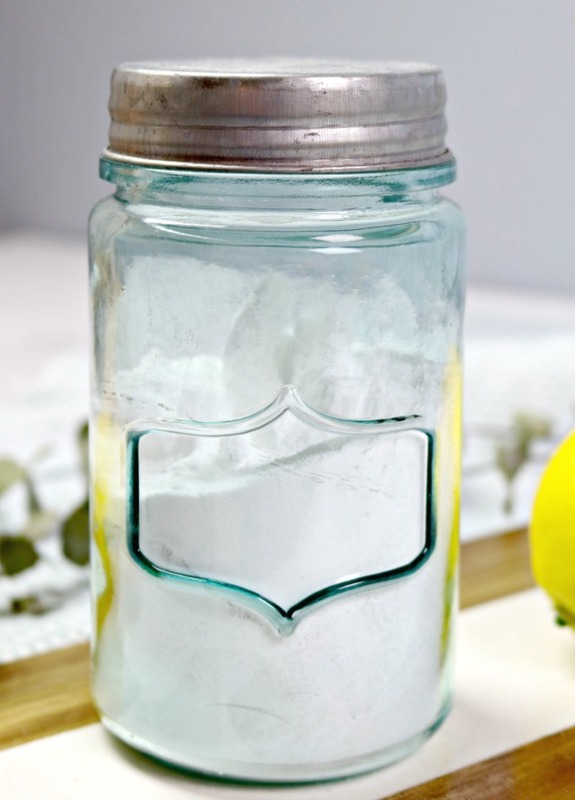 You can easily Make Your Own Washing Soda using Baking Soda HERE! 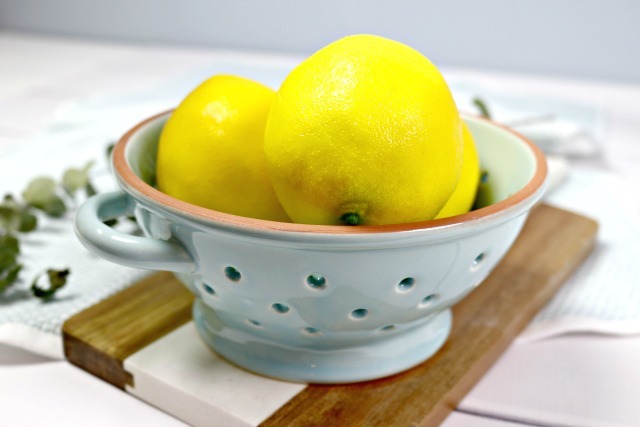 Lemons and lemon juice are one of the best, most natural cleaning objects ever! The natural acidity in lemons helps remove stains, disinfect surfaces and is a great grease fighter! Citric acid is an ingredient usually used for canning fruits and vegetables, but it has great cleaning properties too! When mixed with other natural cleaning ingredients, it can cause a fizzing action that will help lift stains from dishes, toilets and drains too! Kosher salt isn’t just for cooking and seasoning food. It also makes a great scrubbing agent when mixed with oil and a gentle cleanser when mixed with lemon juice. Witch hazel is widely know for soothing skin issues like acne, razor burn and diaper rash, but it also makes a great additive to any room spray or fabric refresher. 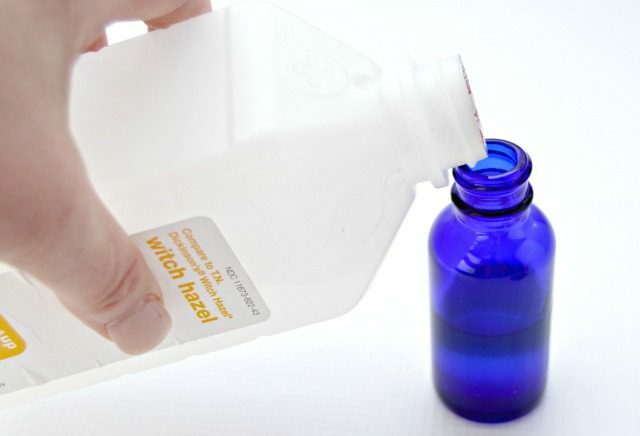 If you add essential oils to witch hazel, you can make a great spray that won’t fade away quickly and won’t stain fabrics. Say goodbye to pet smells, stinky diaper smells and lingering food smells in your home! 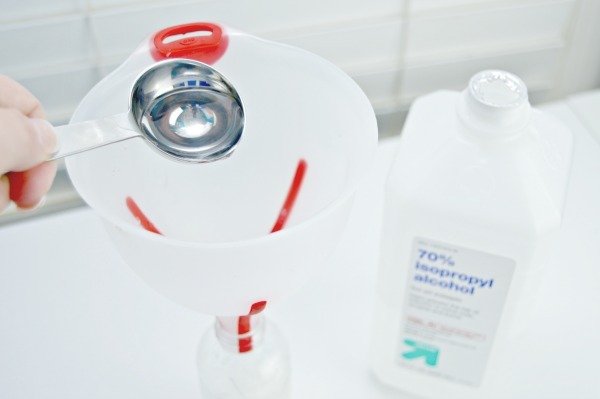 Hydrogen peroxide is a super stain remover and also whitens whites without harming colors. Have a wine or grass stain that just won’t come out of your clothes? Hydrogen peroxide will be your new best friend! Isopropyl alcohol combined with a couple more ingredients makes a safe granite cleaner that dries super fast! It also makes a life saving ice melter for your windshield in those cold winter months! 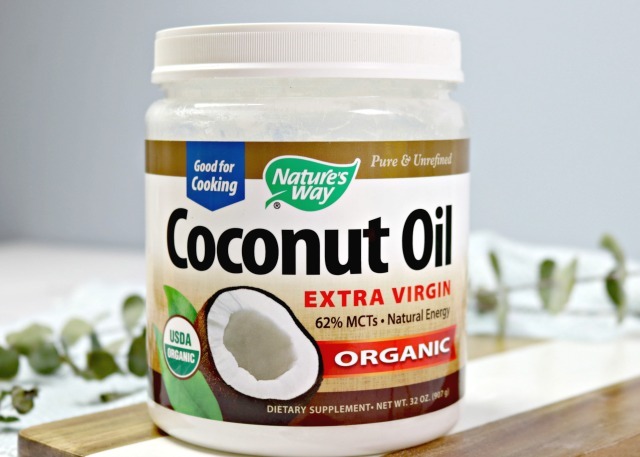 Coconut oil is of course the newest, greatest item on the planet! I use it as a face moisturizer, a body lotion and to remove my makeup, but it can also help clean things like leather furniture and the interior of your car! Hopefully these ingredients and cleaning solution recipes will help you get started moving in a more non-toxic cleaning direction. As you can see, these ingredients are used together in lots of different ways, so they really do go a long way! 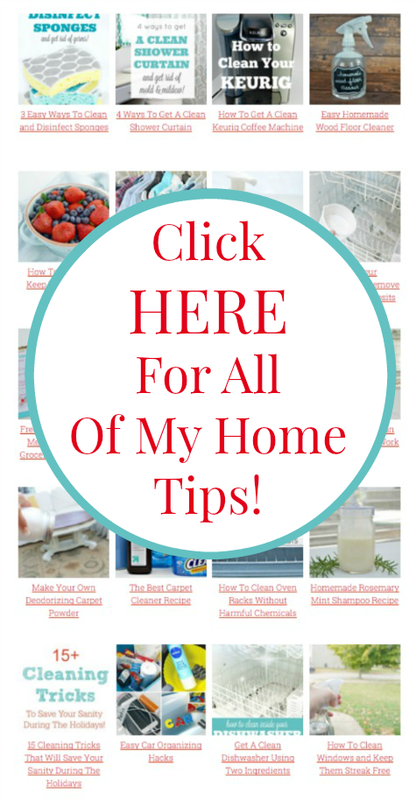 You can check out hundreds of my Cleaning Hacks and Home Tips HERE on my Home Tips Page! Do you have to put the cleaners in a glass bottle or can they be put in plastic spray bottles? Just wondering if there was a reason behind it or if it’s a preference. Where did you buy your essential oils and citric acid from? Guess who was right…. NOT ME! All these simple and friendly ingredients work BETTER than the harmful ineffective crap I have wasted so much time and money on! Thank you so much for being so generous to share these gems of knowledge! I have 5 fur babies and a toddler that will benefit from your natural remedies and a mommy off to the start of a natural remedy of keeping life clean. I know it’s so crazy that these things work! Thank you so much for your kind words this morning, you sent them right when I needed them. I hope you have a beautiful day! I LOVE your site!!!! I actually saved it to my phone’s homepage! I will use it as a reference guide! Thank YOU for sharing! I wish that you had a “printer friendly” option to print all of these GREAT cleaning solution recipes! What an awesome idea! I didn’t know you could save link! You’re now on my home page too.